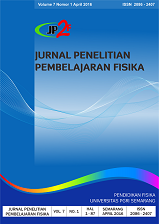 Jurnal Penelitian Pembelajaran Fisika (JP2F), with a registered number ISSN 2086-2407 (Print), ISSN 2549-886X (online) is a scientific journal published by the Physics Education Study Program Universitas PGRI Semarang. The purpose of the publication of this journal is to disseminate conceptual thoughts or ideas and learning Physics research results that have been achieved, both at school and in college. Scope of publishing JP2F, contains the results of learning physics, both at school and in college. Jurnal Penelitian Pembelajaran Fisika (JP2F) has been accredited as a scientific journal by the Ministry of Research-Technology and Higher Education Republic of Indonesia: 34/E/KPT/2018 PERIOD: 2018-2022. Please read this guide carefully. Authors who wish to submit their manuscripts to the editorial office of the Jurnal Penelitian Pembelajaran Fisika (JP2F) should obey the writing guidelines. If the manuscript submitted is not in accordance with the guidelines or written in a different format, it will be rejected by the editor prior to further review. The editor will only accept manuscripts that meet the specified format. Author Fees [HERE].